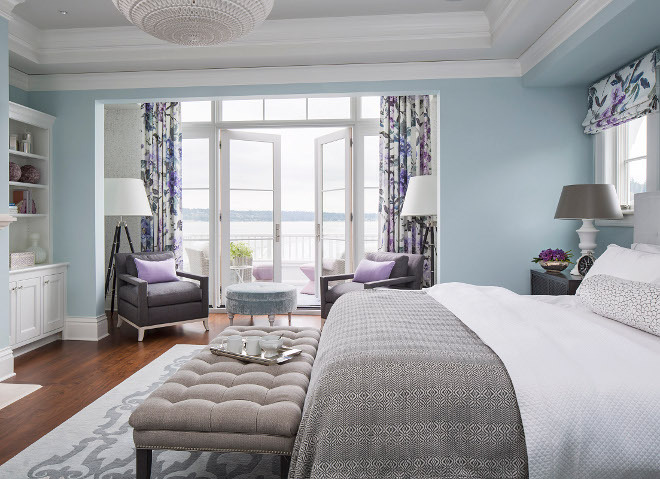 This waterfront property in Washington State was every designer’ s dream project. 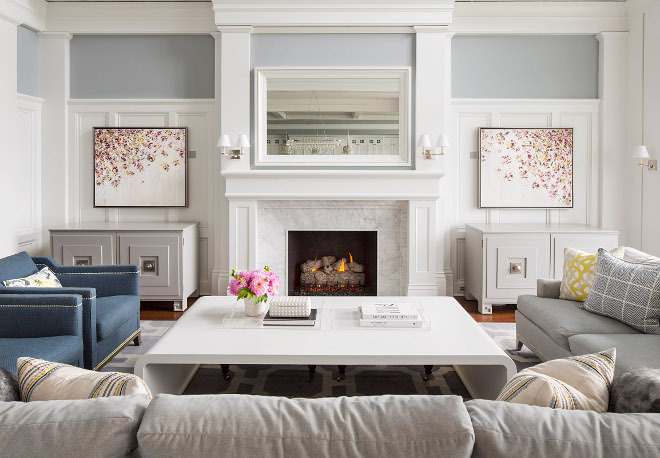 The homeowners fully entrusted the design team at Martha O’ Hara Interiors to get creative with a blank canvas, encouraging imagination and embracing color. 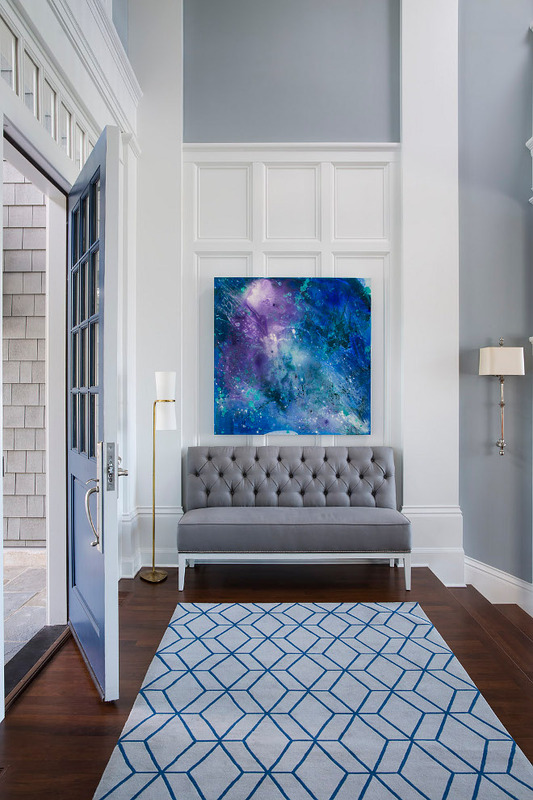 The home’s transitional style accommodated for beautiful custom pieces that combined traditional elements with modern tastes, and exceptional styling without any qualms or limits. 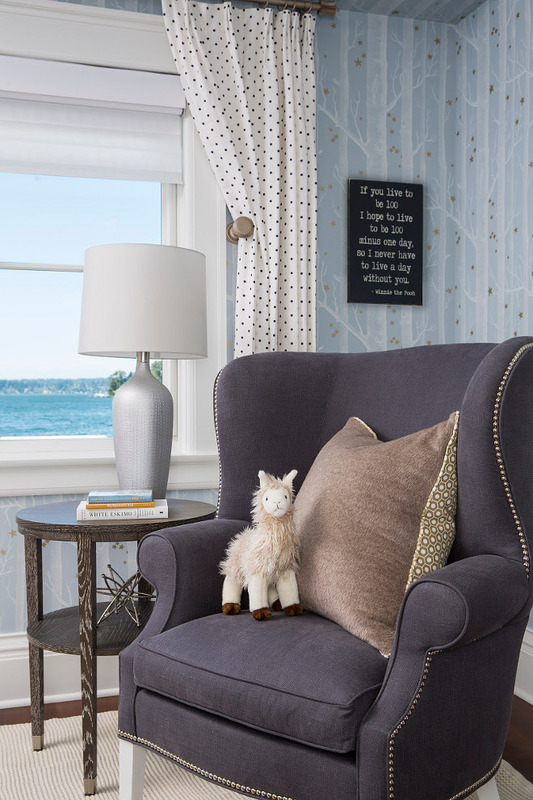 To soften and ground each room, designers Krystal Kellermann, Christa Gibbs and Jayme Meyer hand-picked over ten custom Fay + Belle rugs in a variety of sizes – from a small 2x 4 accent rug to a stunning 12×20 gray geo-pattern rug in the great room. 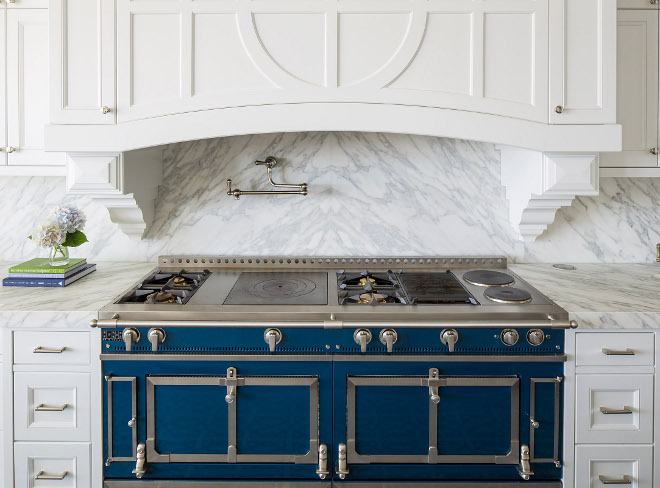 Another impressive selection: the oversized French La Cornue range in cobalt blue, which beautifully contrasts with the white cabinets of a outstanding classic white kitchen. 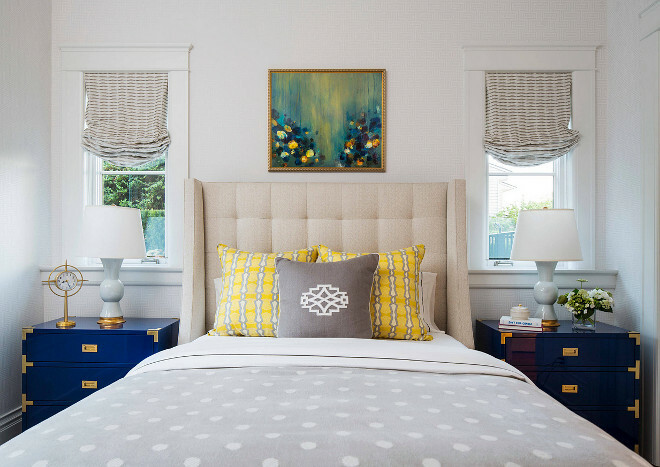 Take notes on paint colors, decor and more details shared by the designer! 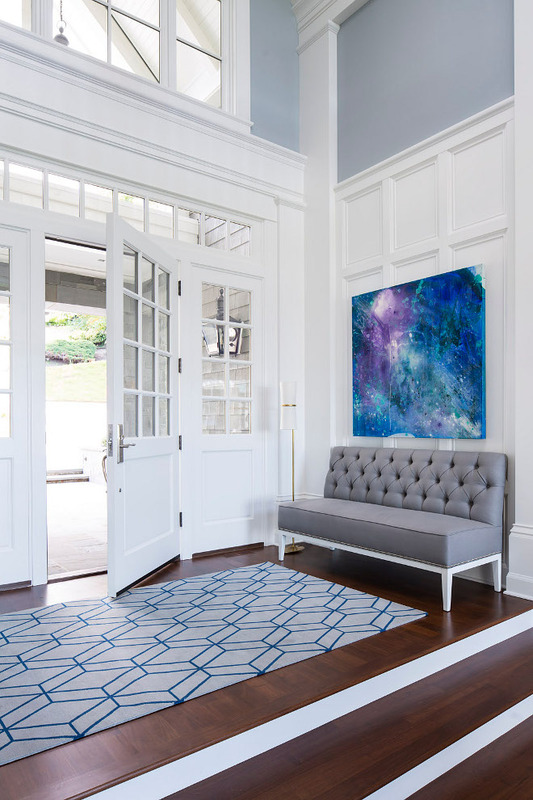 The foyer of this beach house welcomes you with a new take on “blue and white” decor. 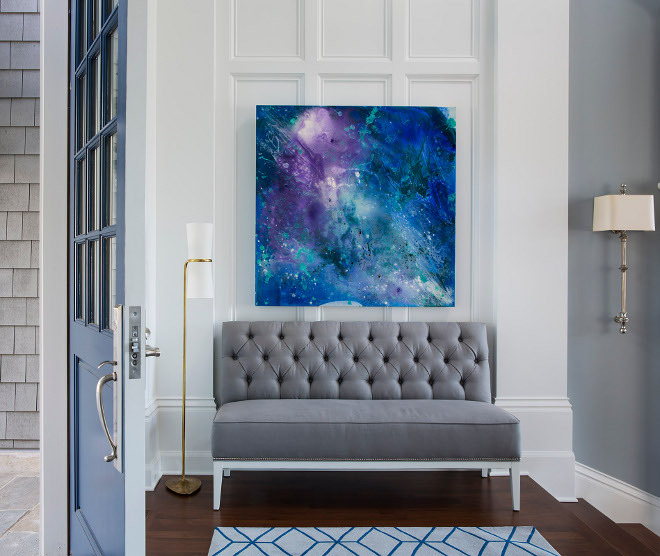 Classic white wainscoting and a blue front door, painted in Benjamin Moore HC-155 Newburyport Blue, are complemented by an eye-catching abstract art. The art is by Drew Beson, Drew Beson Art Gallery, Minneapolis. The custom Hickory Chair Settee is available through Martha O’Hara Interiors. Rug is from Fay + Belle. 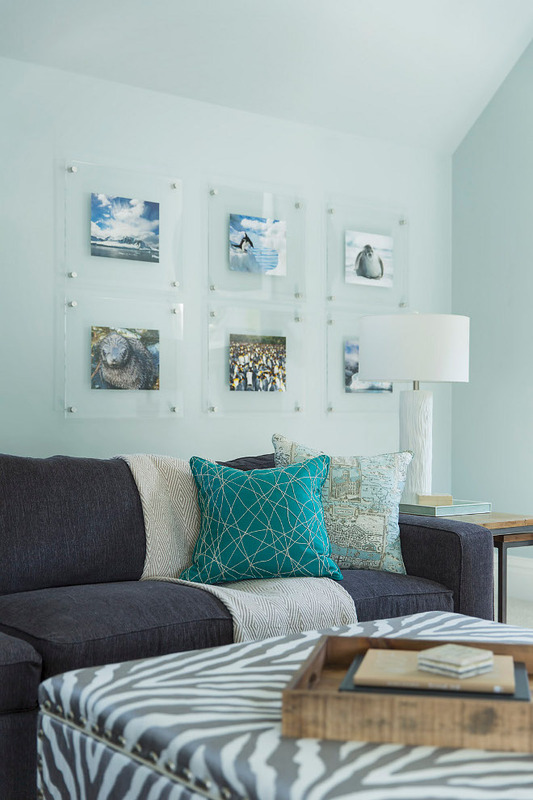 The paint color used on the walls here is Sherwin Williams Passive 7064 in a flat finish. The open layout and the floor-to-ceiling windows found in this space invite the water view in. 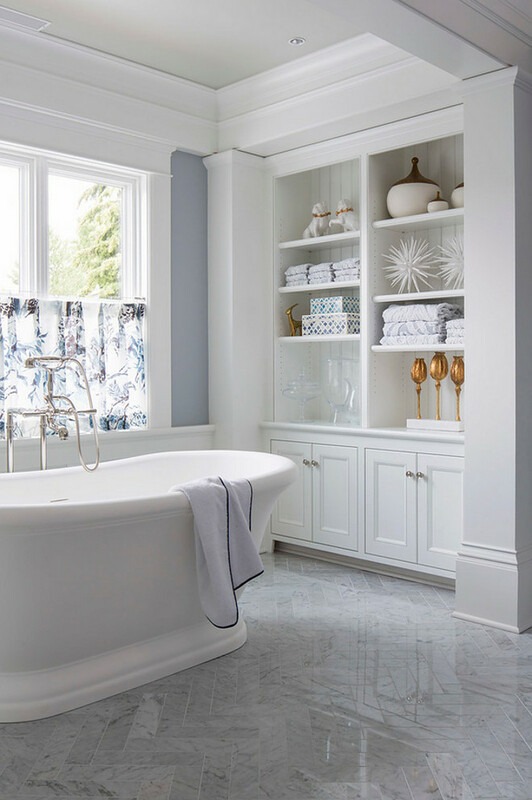 Millwork is painted in Benjamin Moore “ White Heron ” in satin finish. What an inspiring furniture plan for large living rooms! The geometric rug is from Fay + Belle. Main floor walls: Sherwin Williams “ Passive SW 7064 ” in flat finish. This has to be one of my favorite kitchens ever designed by Martha O’Hara. Isn’t it perfect? Its timeless design is impressive in every detail! 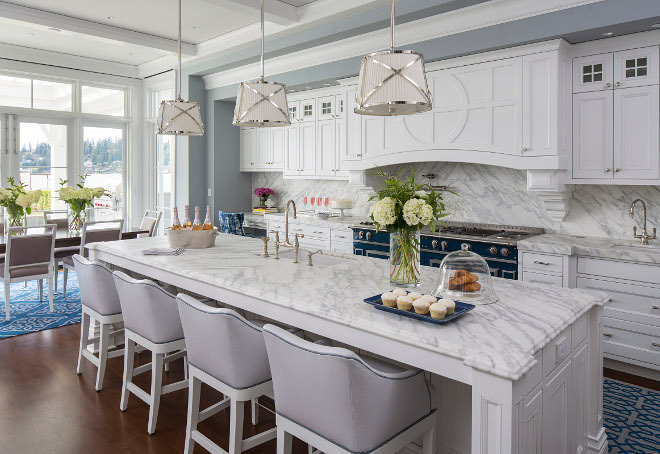 Kitchen Island Countertop: The island countertop is white marble, Calcutta Extra, with a double ogee edge. Lighting is Grosvenor polished nickel pendant. Ceiling paint color is Benjamin Moore“ Paper White ” in flat finish. The custom Vanguard Furniture Stools are available through Martha O’Hara Interiors. 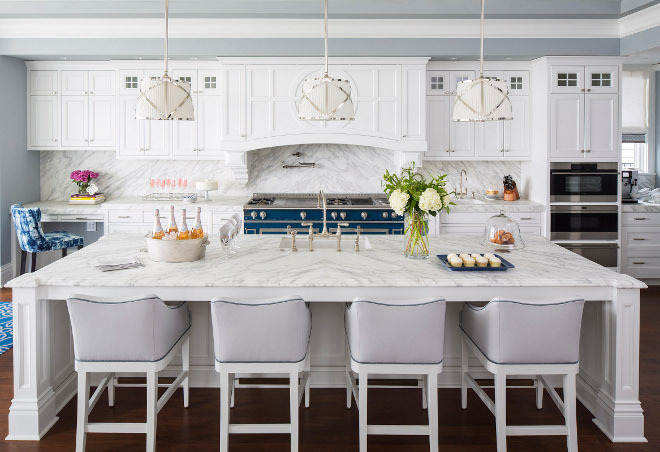 Backsplash is Calcutta Extra slab and the blue range is a French La Cornue range in cobalt blue. A smaller option can be found here. 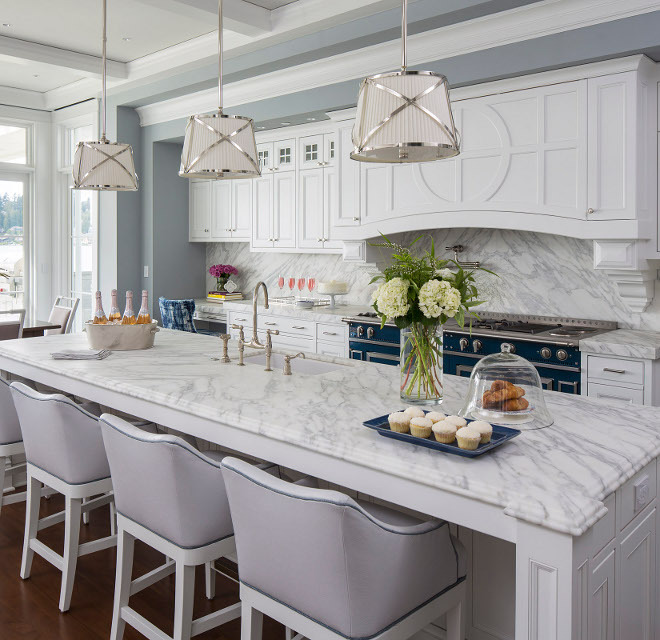 The inset cabinets are painted in Benjamin Moore White Heron OC-57. 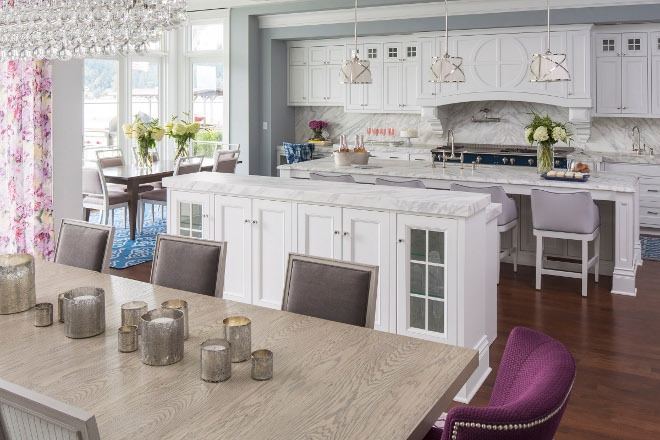 A buffet-style island separates the dining room from the kitchen. 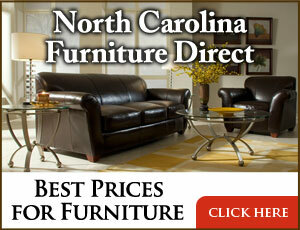 Cabinet Hardware: The dining room buffet has Grayson Crystal Knobs. Notice the stunning view and the decor. 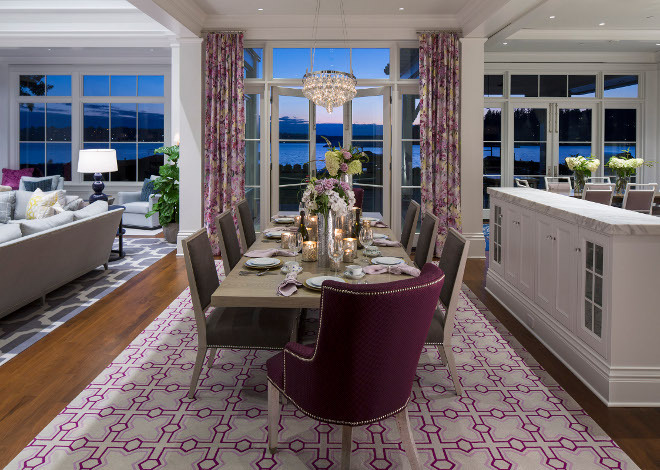 The dining room lighting is Polished nickel Arctic Pearl chandelier by David Sutherland. 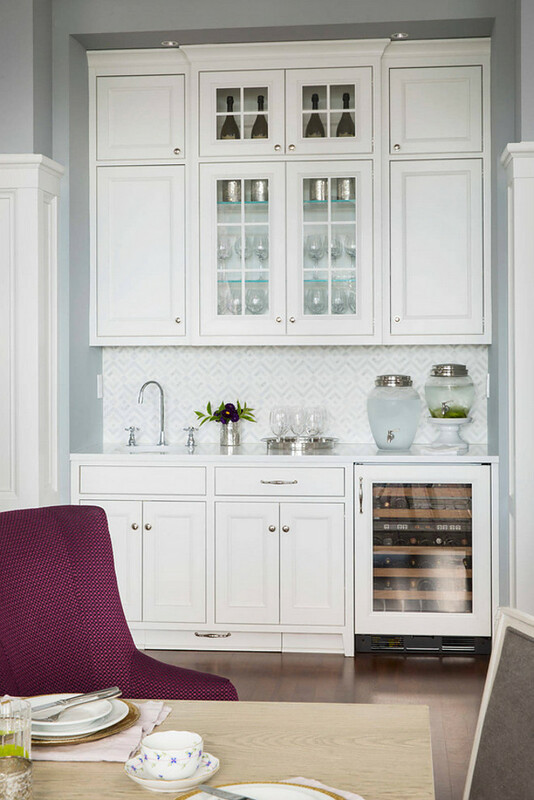 A small butler’s pantry is tucked in a nook in this dining room. Practical idea! French doors with window transoms open to a large patio. Located by the kitchen, this mudroom/laundry room features slate floor tiles and beadboard paneling. The rug is a custom Turkish patchwork design by Fay + Belle rugs. 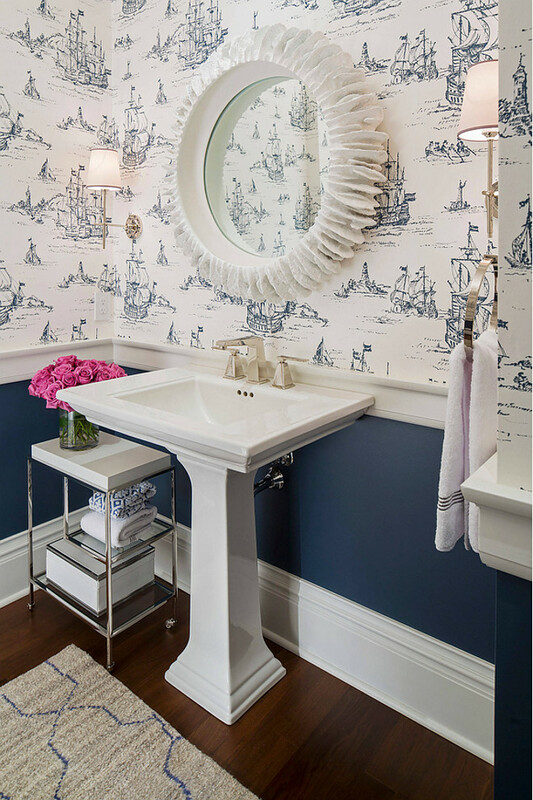 Powder Room Wallpaper: This coastal wallpaper is by York Wallcoverings. The stairway runner is Zb Lenz – Desert Night SKU: b05-dnit-bouc0216 by Stark. Blue Bedroom Paint Color: Benjamin Moore 2136-60 Harbor Haze. 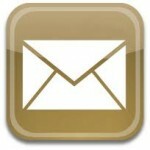 Drapes: The drapes are custom made stationary drapes with an inverted pleat. The mater bedroom also features matte white finial table lamps with painted parchment empire shades and a Camden Bench by Jessica Charles. Rug is from Fay + Belle. 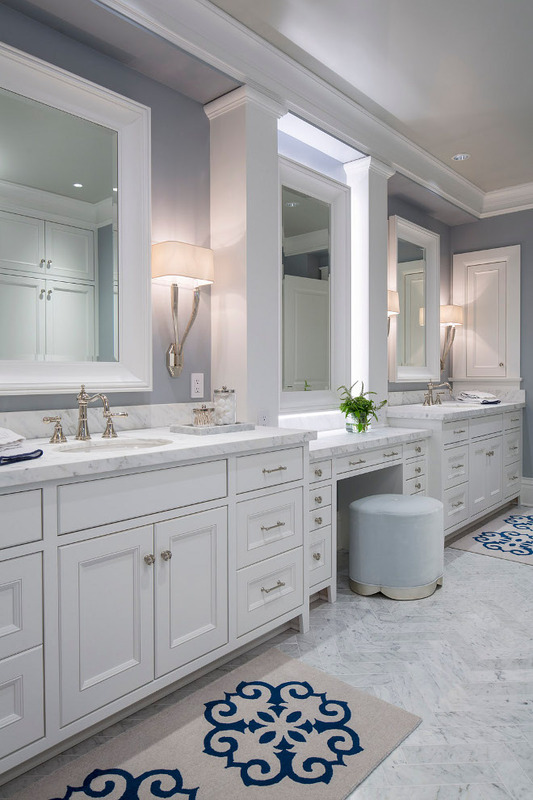 I am loving the cabinet layout… it’s perfect for a large bathroom. 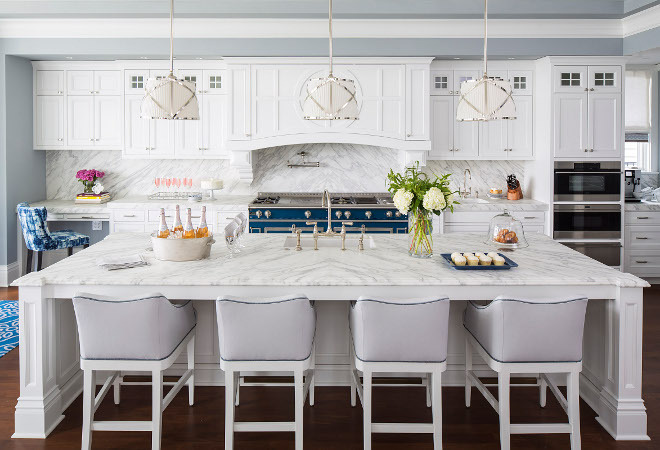 Flooring is marble Bianco Carrara tile in a herringbone pattern. 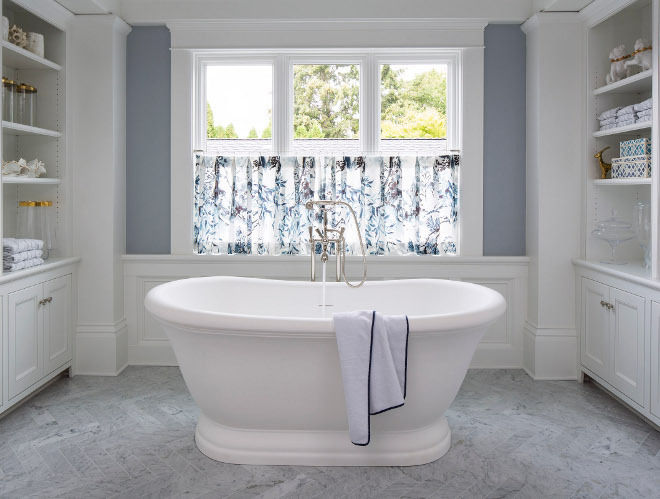 A freestanding bath is tucked away in a nook with built-in cabinets on both sides. Window Treatment Fabric: Shangrila Garden – Violet. 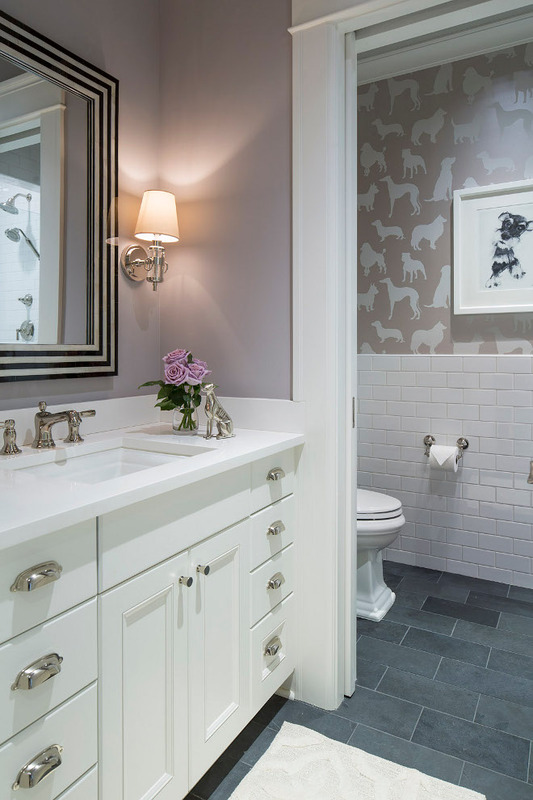 The built-in cabinets offer plenty space for decorative elements and extra storage for fresh towels. 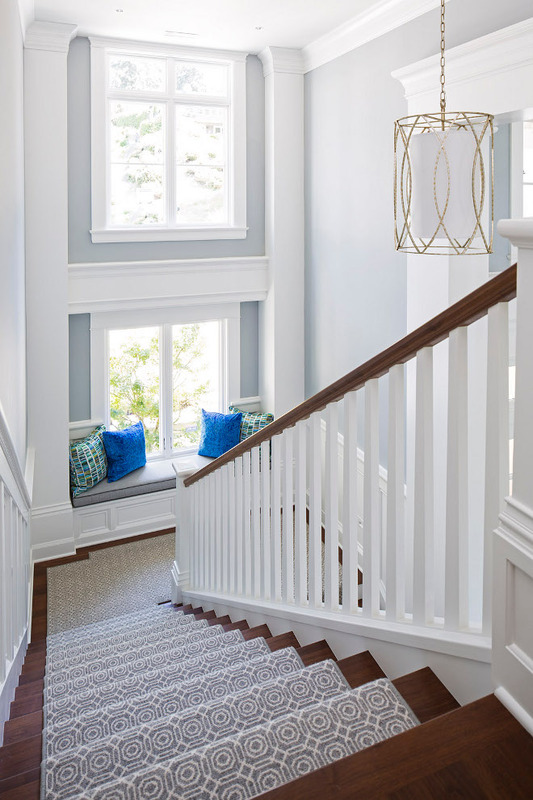 Wainscoting is painted in Benjamin Moore White Heron in satin finish and the wall color is Sherwin Williams Passive 7064. These colors look very crisp together. 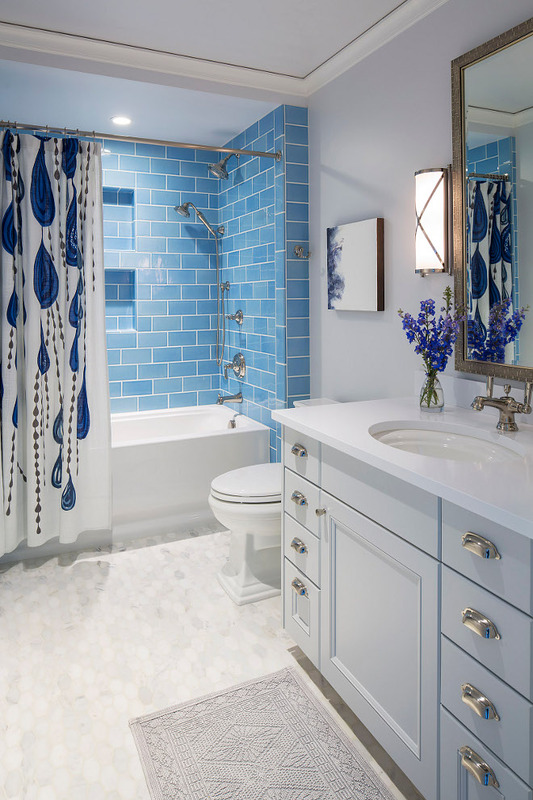 This guest bathroom features blue subway tile and hex marble floor tile. Isn’t it a lovely combination? 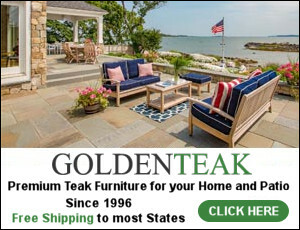 Similar Blue Gray Paint Color: “Benjamin Moore Wales Gray”. Isn’t this color palette fresh? I am loving seeing navy against yellow and brass. This is perfect for spring! The navy side tables and the glazed porcelain Tao lamps with antique gold leaf base are both from Bungalow 5. Cabinet paint color is Benjamin Moore White Heron in satin finish. 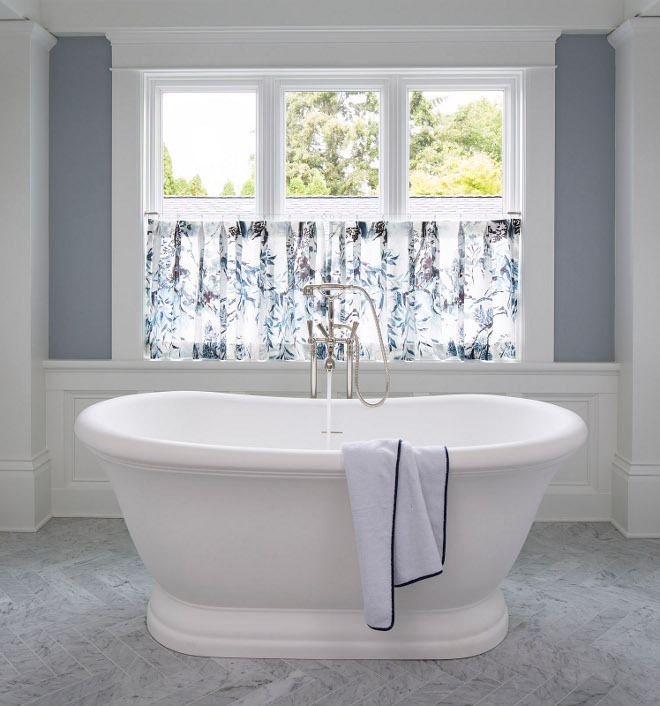 Countertop is white quartz and shower features a glass subway in cobalt blue. Wallpaper is Thibault Songyue Pearl. 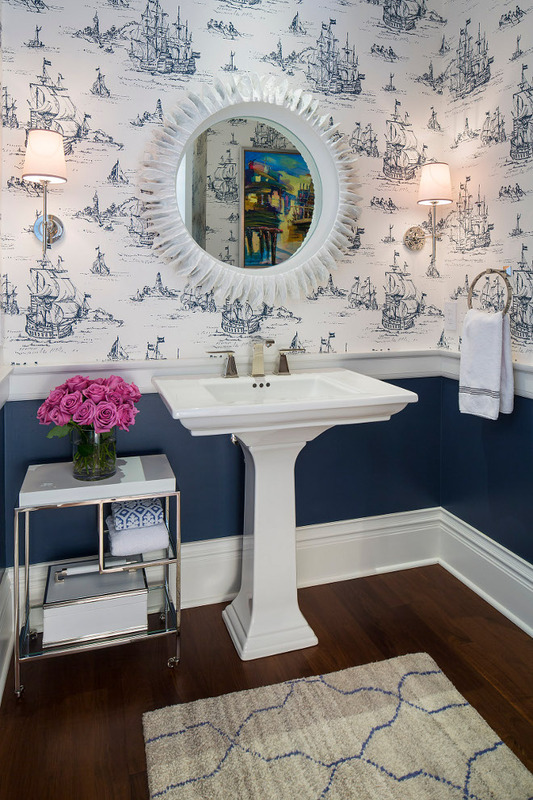 This Jack & Jill style bathroom features a great layout and an adorable wallpaper; Osborne & Little Best in Show. Vanity paint color is BM White Heron OC-57. This color brings a fresh feel to any space! Paint color is Benjamin Moore Woodlawn Blue HC147. 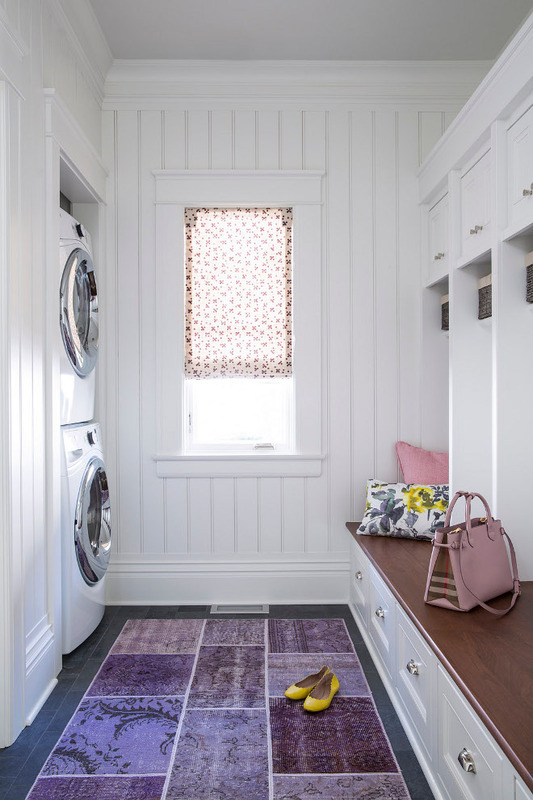 Located on the second floor, this laundry room features soft pale pink cabinets, painted in “Benjamin Moore Organdy 1248”, and a soft gray leopard print wallpaper. It sounds a lot, but it works perfectly together, doesn’t it?! 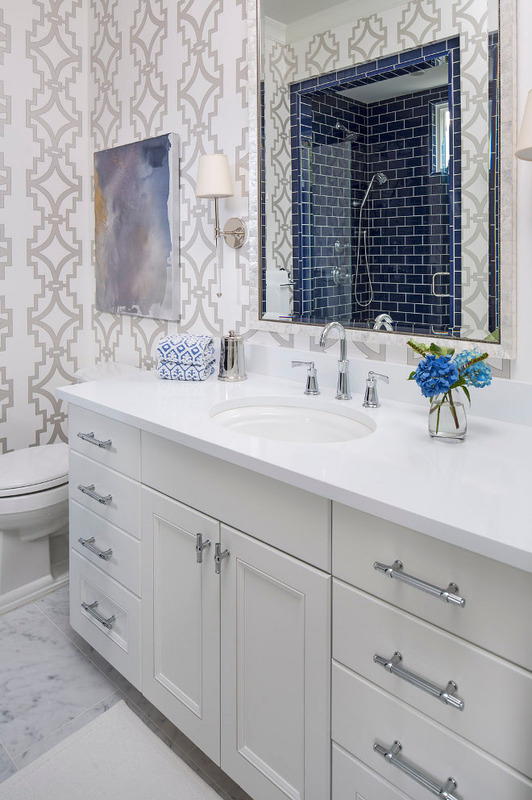 Wallpaper is by Schumacher and countertop is white quartz. 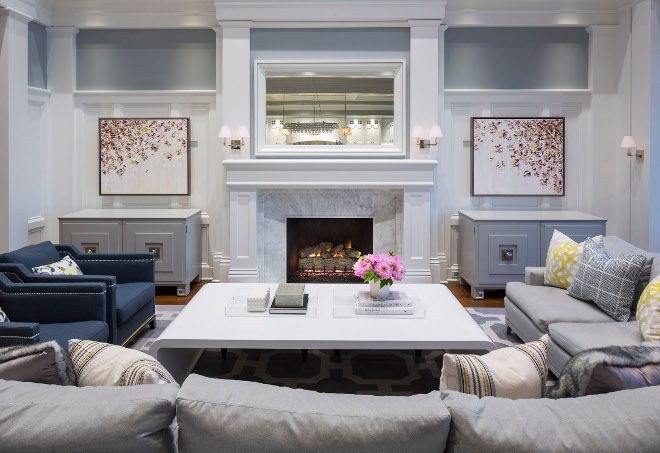 Click here to see more interiors designed by Martha O’Hara Interiors. Go through this day nurturing yourself. Make sure to know, in your heart, that you are loved, that you are walking in the right direction for a better life. Each step is bringing you closer to balance and harmony. Live this day with Love and Kindness. I will try to do the same around here. Thank you all for being here. I really hope you enjoyed this time, my friends! So many wonderful images and I love seeing the laundry room – such a fun and unexpected color. Hope your day is great, Luciane!